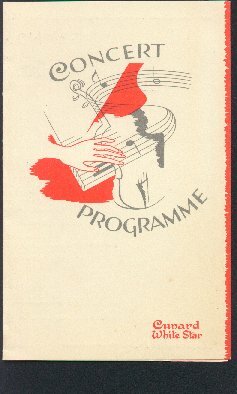 "Concert Programme - Cunard White Star Limited - R.M.S. Media - August 12, 1949." (843) Concert Programme - Cunard White Star Limited - R.M.S. Media - August 12, 1949- Condition: Excellent Media was the sister ship to the Parthia II (see #842). Folded Card listing the Concert Programme for that night, including the Orchestral Selections, Community Singing Selections, and various other performances, including the promise of a surprise or two. Captain listed as: J. Quayle. The Card measures 5" by 8 1/4" (folded size). For some great information on the ship Media, visit: http://www.bytenet.net/steamers/media.html Price: $7.50 + Shipping.